Globe now offers network-billing for over 1.3 million Google Play apps. From social networking, music streaming, down to booking a restaurant or securing that elusive parking spot, there is an app for anything you can think of. Be it a free app, a paid or premium one, the Google Play Store has everything for every type of mobile phone user. Majority of Filipinos though have to stick with free apps to use, due to non-ownership of a credit card, one way to pay for premium apps on Google Play Store. According to the CIA Fact Book in 2013, only 4% of Filipinos own credit cards. All that is about to change as Globe Telecom makes purchasing on Google Play Store easier and more convenient. Progressively rolling out starting August 20, Globe Postpaid, Prepaid and TM customers may now be able to purchase any app or in-app item on the Google Play Store and charge the cost directly to their load or Postpaid bill! No credit card needed! “Globe has always prioritized a differentiated customer experience. Our goal is to provide products and services that make our customers’ lives easier and more convenient especially now that more and more people are going mobile. The convenience of purchasing your favorite apps and in-app items using your Globe load or postpaid bill really makes a wonderful difference to our customers’ overall experience with Globe,” shares Globe Vice President for Digital Media Glenn Estrella. 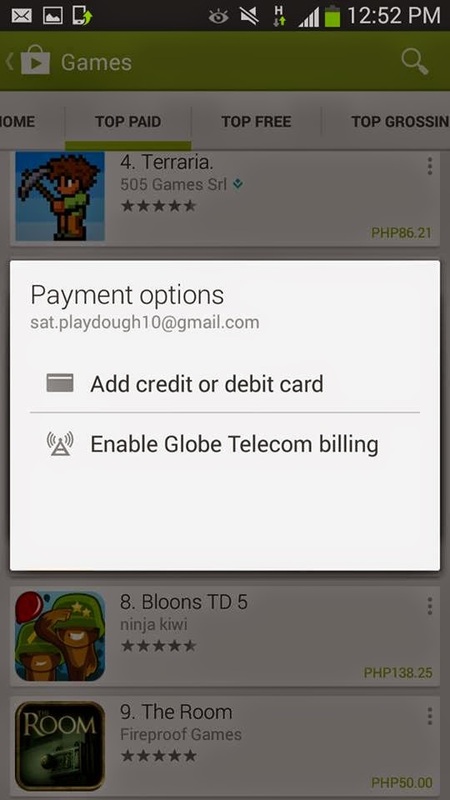 To begin purchasing apps, first time users just need to select the app they wish to purchase in Google Play Store, accept the app permissions and on the payment options menu, select “Enable Globe Telecom Billing”. After agreeing to the Terms of Service, register your phone number, name and address then the payment will be processed successfully. For succeeding purchases, you just need to enter your Google ID and password to continue processing the payment. Recently, Globe also announced that its network already has 100% 3G coverage, and by end of September this year, 100% 4G HSPA+ coverage, enabling faster and more seamless browsing for its over 44 million mobile and broadband customers. With Globe and Google Play Store, experience all the new and wonderful apps and in-app features the app world has to offer!